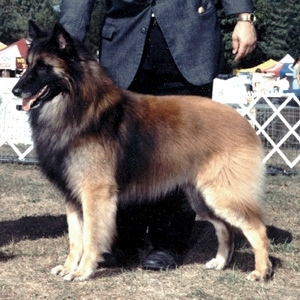 Luc was my first dog, my first show dog, my first Belgian Tervuren, my first herding high-in-trial dog, my first Champion, my first obedience dog. Luc introduced me to new places, new people, new adventures. But more than any thing, Luc was a good dog. He was my boy and he never wanted to be anywhere but with me. And I miss him. He was gone too soon. If there is anything I would like as his legacy is that other Belgian owners participate in the MSU Gastric Carcinoma Study. Jean-Luc was bred by Linda L. Robey and Donald M. Lankster of High Ridge, Missouri.